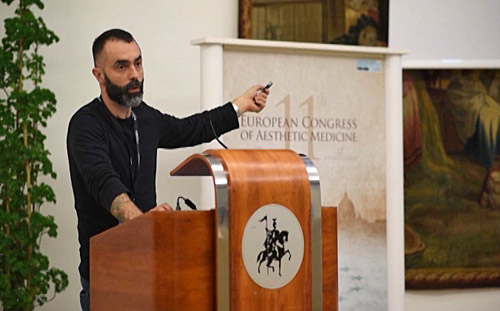 The 37th National Congress of the Italian Society of Aesthetic Medicine, this year has had the honor to host the 11 th European Congress of Aesthetic Medicine. During the days of May 13-14-15, the most prestigious and distinguished international speakershave brought their expertise in all areas of Aesthetic Medicine, making this event the most important occasion for meeting and cultural exchange as part of this discipline. 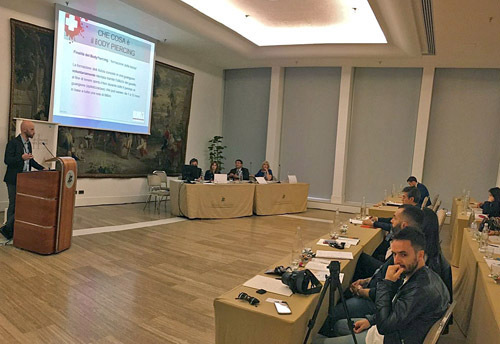 The event was held in the conference hall of the prestigious Hotel & Resorts Knights Waldford Astoria in Rome and saw the participation of speakers from 20 countries, not only Europeans; among them also the intervention of the President of A.P.T.P.I. (Association piercers and tattooists Italian professionals) Valsecchi Bruno (piercer) and Emiliano Marchetti Secretary (tattooist). Not only aesthetic medicine, but also a concern to the Body Art in all its forms of expression are seeing in close cooperation synergistic medical staff (surgeons, psychiatrists, dermatologists, ASLdi Roma etc) and professional operators of body art, with a one main objective: the security, professional ethics and the protection of public health. The intervention of Valsecchi focused on themes reflecting the main objectives of APTPI as biosafety, the choice of materials, techniques of performance of a piercing in safe conditions, possible complications, the damage caused by the ear piercing gun, brief history of piercing in subcultures and currently, studies and research on the epitalizzazione process. The tattoo art was instead represented by the member dell’A.P.T.P.I Emiliano Marchetti who as speaker focused on requirements and hygienic maneuvers appropiate for performing tattoos. The Valsecchi interventions and Marchetti have caused astonishment and concern of the doctors present in the room, confirming that every year is getting closer and closer two disciplines that have different purposes, but an identical code of ethics. The nonprofit organization A.P.T.P.I. He is pleased and honored to have been able to assist and share with all the participants, the information based on extensive studies and ongoing research that made the body art a form of highly secure physical expression, following some very clear lines of work, hoping that they become increasingly popular and which are applicable and evolve on the national and European territory.